Smart ID®: The capability to support biometric identification is combined with the portability of smart cards. The result is irrefutable identification while crossing borders, whether local or international. Personal identification on a smart card is combined with the ease of contactless operation to authenticate access and secure all facilities. The cards support multiple security technologies, including magnetic stripe, picture ID, contactless smart chip and more. 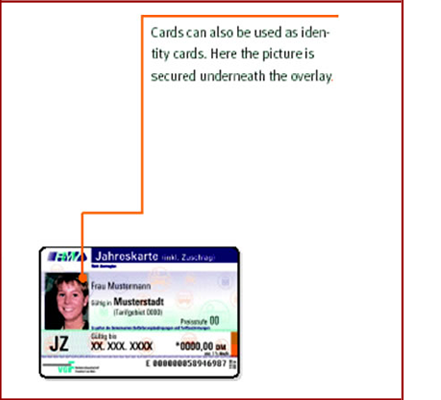 The employee's profile is defined on the card – an easy way to maintain employee status and pass permissions. For example, an employee's access can be limited to specific doors at specific dates and times, or structured according to a defined user profile group. Since access information is stored on the cards, the system is not dependent on communication networks between locations. Any employee at a secure remote site can be authenticated off line between the card and the reader itself, using a one-to-one comparison between the user and the card. The system enables a hierarchy of security levels according to the needs of each facility, such as PIN protection, biometrics (fingerprint, face recognition, hand geometry), etc. The smart reader is a capable of interfacing to existing systems through Wiegend protocol..